Possibly one of the highly anticipated Fast & Furious movies in their extremely long running franchise. It is quite amazing and probably the biggest compliment that people are still waiting and wanting to see these movies and they won't be disappointed with the next installment. At the end of Fast & Furious 6 you are briefly introduced to possibly the worst villain in all the movies, Deckard Shaw (Jason Statham), who is the big brother of the villain from Fast & Furious 6; Owen Shaw, and looking for revenge to the people that put his little brother in hospital. Dom (Vin Diesel) has to bring the whole gang back together for one more ride, Brian (Paul Walker), Letty (Michelle Rodriguez), Roman (Tyrese Gibson) and Tej (Ludacris) all join Dom for a mission to save a hacker called Ramsey (Nathalie Emmanuel) and then in the process track down Shaw and 'take him out'. Not giving away too much from the movie, as I don't want to ruin the scenes for you. But what can you expect - muscles, cars, fights, explosions, superb slow motion staring, great one liners and watching characters outdo another's manliness. The stunts in this movie are just completely out of this world, Brian in the movie says 'Cars don't fly', this movie definitely throws the out of the water, with cars being parachuted from planes and flying from skyscraper to skyscraper, you'll be sat in your seat, eyes wide open wondering how the hell they just got away with putting that in a movie. But it works! 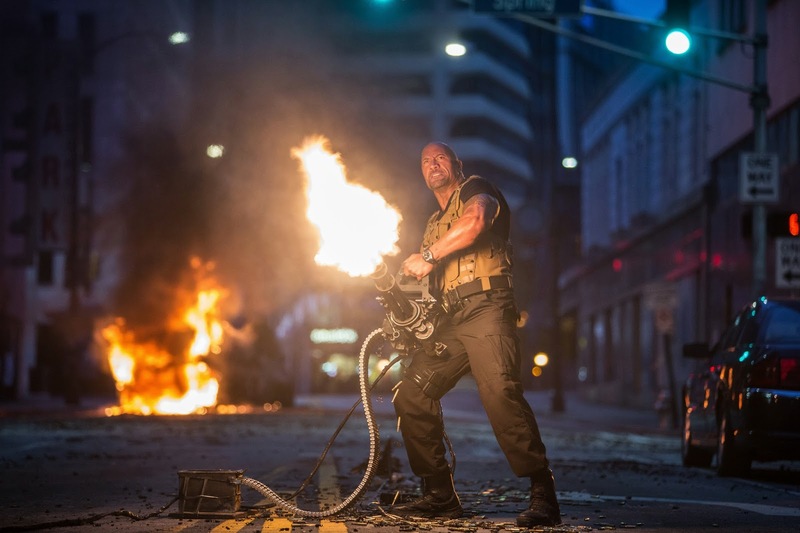 Dwayne Johnson is back in this next installment as government bounty hunter Hobbs, probably one of the funniest moments of the movie is when Hobbs gets up from his hospital bed, breaks his cast with pure muscle strength and says to his daughter 'Daddy's gotta go to work' and then steals an ambulance to join the fight and help Dom. The only person who could pull that scene off would be The Rock. As they were filming the movie, tragically Paul Walker died in an off-set car crash a couple of months into filming. The plot was rethought, the script altered, body doubles used (including Walker's brothers), it is hard to see what perhaps the original story might have been, but there is definitely an emphasis on family. The scenes at the end of the movie are so touching and a simply beautiful tribute to Paul Walker and the character that made him famous, it is hard not to feel emotional. Aside from the fast cars, explosions and great fighting scenes the bond that all these actors have with each other isn't something that is acted, there is true laughter and a family bond that makes the tribute to Paul Walker even greater. Who knows if a Fast & Furious movie without Paul Walker will make any sense, guess we will just have to wait and see.